"Minecraft-Schematics.com" will be one year old in few days. To celebrate this, the version 1.4 of the website is now finished. Some features of this new version were available since some weeks but new features has been added recently. "Minecraft-Schematics.com" does now support "World Save" file format. This file format allow users to post really bigger creations than with schematic file format. 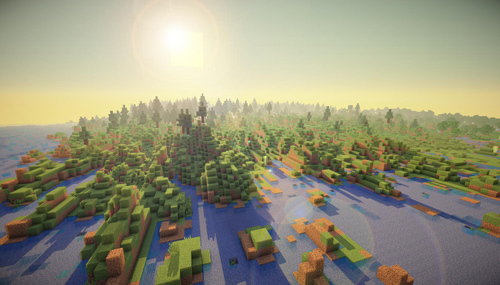 You can now share a whole Minecraft world!!! We have now a great team of moderators. They will help us to test creations available and make sure that you are downloading working creations. In the future, we will give them more and more tools to help them in their job. We will also try to find a way to thank them for their great work (gifts). Few days ago we have launched a servers list for Minecraft Pocket Edition. If you have a Minecraft PE server or if you are looking for a server to play on, I invite you to visit MinecraftPocket-Servers.com. Minecraft-Schematics.com does now support "World Save" file format. This new feature is a really big addition that should bring bigger projects on Minecraft-Schematics.com. There is no need to send any more moderator applications, our staff is now complete. Congratulations to our new moderators and I'm sure that with them, Minecraft-Schematics.com is gonna be even better. We have received more than 170 moderator applications. If you have not received an answer for the moment, it means that you have passed the first selection. We are now in the final selection process. To finish, there is no need to send any more applications, we have already too much candidates. "Minecraft-Schematics.com" is now 10 months old and new features are coming soon. With almost 1,000 schematics, every day more than 2,000 visitors come on "Minecraft-Schematics.com". To handle this, it is now time to get a team of moderators. Do you like "Minecraft-Schematics.com" and want to help? So apply to become a moderator. What are the tasks of a moderator? How to apply to become a moderator? - What is your age? - What is your account on Minecraft-Schematics.com? - Do you have a Minecraft server? If yes, what is the address of your server? - How many times per week can you give to Minecraft-Schematics.com? - Is english your native language? The achievements system of "Minecraft-Schematics.com" has been updated. This update is a part of the coming 1.3 version of our website. We will add more achievements soon. We have released an update to the user profile page.